… because there is no comparison between these two themes as such. Astra wins this comparison battle hands down! But before I start this Astra vs Genesis comparison, I want to make sure that you understand few things very, very clearly. I am writing this Astra vs Genesis comparison after using Genesis for more than 5 years and Astra for more than 1 year. I am writing this Astra vs Genesis comparison with a heavy bias towards Astra because I know that Astra is a far better theme than Genesis. I am writing this Astra vs Genesis comparison without actually comparing each feature of Genesis with each feature of Astra because you can find such kind of comparisons all over the internet. 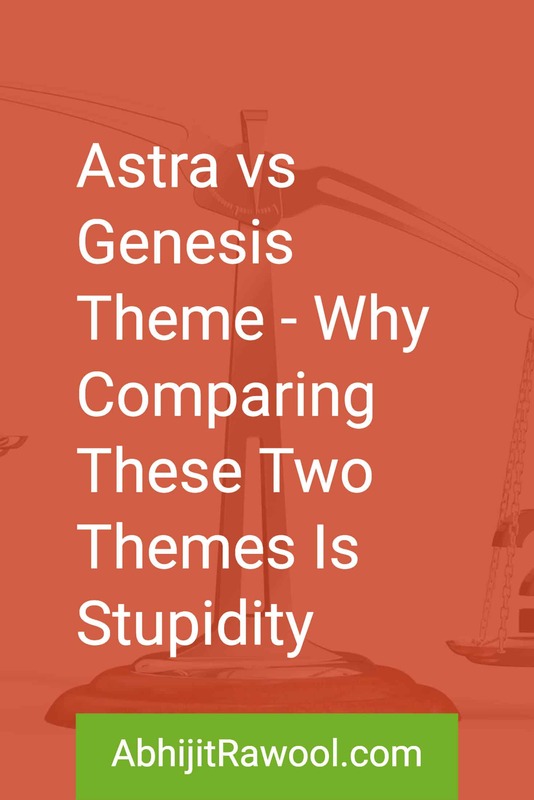 And I am writing this Astra vs Genesis comparison by comparing Genesis theme with the paid version of Astra theme, Astra Pro. Imagine you bought a house. That house has everything that will make your neighbours red with envy. It has a Centralized Air Conditioning and Heating System, Wooden Flooring, Modern Kitchen, Fully Furnished Rooms and many other features that would make you proud of your house. You cannot change anything inside or outside the house by yourself because changing anything needs special skills that you do not have. You cannot move your furniture, you cannot change the colour of the walls, you cannot lay a carpet on the floor, you cannot do anything by yourself because all of these changes need special skills. You will have to pay someone else with the required skills to make any changes to your house. If you are still adamant on making the changes by yourself, then you will need to learn those special skills from someone else by paying them to teach you those skills. In the worst-case scenario, you might even have to pay someone else a monthly fee so that you can keep learning skills that are needed to make changes to your house by yourself. In short, you are stuck with the house you bought or you will need to spend more money to make it look the way you want it to look. Your dream house has quickly become your worst nightmare. This house that I am talking about is the Genesis theme. If you were to use Genesis theme on your website, then be ready to spend time and money to learn how to code because Genesis will force you to code even the smallest of the changes that you want to make to your website. Want to change the fonts on your website? You will need to write code for it. Want to change the font sizes on your website? Write code for this too. Want to change the colour of the links on your website? Please write code for it. Want to make your header stick to the top of the website? Write code my friend. Want to change the layout of your blog page? Write code, write code! I can keep going but I guess you got the point. Now imagine that you bought another house which has all the same features of your first house but it does not need any special skills to make changes to it. You can easily move your furniture, change the colour of the walls, lay a carpet on the floor, etc. You can do everything by yourself. This second house that I am talking about is the Astra theme. Astra theme has a lot of built-in features that will help you to make many changes to your website without writing any code. It does not force you to code the smallest of the changes that you want to make to your website. Want to change the fonts on your website? Sure. Just change them in Customizer settings. Want to change the font sizes on your website? Okay. Change them in Customizer settings. Want to change the colour of the links on your website? Again, change it in Customizer settings. Want to make your header stick to the top of the website? Yup, set it in Customizer settings. Want to change the layout of your blog page? You guessed it. Set it in Customizer settings. Again, I can go on and on but I think you again got the point. Genesis theme will force you to write code while Astra theme will not force you to write code. That is the basic difference between Genesis theme and Astra theme. Are You Interested In Saving Time? And I also know that by now you have realized that Genesis theme is going to consume a lot of your time if you ever want to change the look of your website. So why would you choose Genesis theme? You are the one looking for Astra vs Genesis comparison. If you ask me, I don’t see any point in using Genesis theme unless you are adamant on spending time to code your entire website or to go hunting across the internet to find snippets of code that can help you change the look and feel of your website. But I had to ask this question because usually everyone of us is ignorant of the amount of time we spend on tasks created by the tools that we use to build our websites. Genesis theme is going to eat a lot of your time. Period. Astra theme on the other is not going to force you to code the smallest of the changes and nor is it going to force you to hunt down snippets of code on the internet. So go check out Astra theme. Again I know that the answer is Yes. And I also know that you think Genesis theme will save you money because you do not have to renew a Genesis theme license year after year, like Astra’s license. But have you considered the amount of money you might have to spend to learn how to proficiently write code for making full use of the Genesis theme? There are people who have built businesses by just creating trainings and courses that teach other people how to write code for modifying a Genesis theme! There are even people who have built businesses by creating membership sites that charge people on a per month basis to teach them how to write code for modifying a Genesis theme! Have you taken these costs into consideration? I still haven’t included the cost of your time that you will have to spend learning how to write code. Now tell me, do you think Genesis is cheaper? Astra works out to be a lot less cheaper than Genesis. Go check out Astra theme. Are You Interested In Using Page Builder Plugins? Again I know that the answer is Yes for a majority of the people. The days to code everything by hand are long gone now that we have good page builder plugins like Beaver Builder and Elementor. Even after all the innovations that Beaver Builder and Elementor have done in WordPress space, it is just not possible to seamlessly use these fantastic page builder plugins with Genesis themes. The word to note here is “seamlessly”. Yes, there are hacks and other plugins that you can use to make Beaver Builder and Elementor work almost seamlessly with Genesis themes, but this means that you now have to rely on other plugin developers if something was to go wrong. Astra on the other hand just works beautifully with Beaver Builder and Elementor. The team behind Astra has gone to extreme lengths to make sure that Astra integrates well with Beaver Builder and Elementor. Not only that, every time there is an update to Beaver Builder and Elementor plugins, the team behind Astra makes sure that Astra works flawlessly after these updates. This is something I cannot ever imagine being done by the team behind Genesis. So if you are really keen on using Beaver Builder and Elementor then Astra is a much better option. Are You Interested In A Theme That Is SEO Friendly and Secure? One more time, I know that the answer is Yes. I also know that Genesis is marketed as an SEO Friendly and Secure theme. But if you observe very closely, you will realize that Genesis does not have too many features as such to boost about and so a lot of emphasis is laid on Genesis being SEO friendly and Secure. But then, so is Astra. I have been using Astra since it was in Beta and I haven’t seen any negative SEO impact, nor any security vulnerability as such. Besides that, SEO and Security are really broad topics and dependent on a lot of other factors. So it is better to not talk about the SEO friendliness and Security of these themes. Let’s talk about something else though..
Are You Interested In Building Websites For Clients? If yes, then why are you even bothered to search for Astra vs Genesis comparison? Genesis gives you no advantage to use it for building client websites. Yes, there might be occasional situations where a client’s demand can be easily fulfilled by coding a Genesis theme but those situations should be exceptions rather than a rule. Other than that, Genesis might even slow down your speed to deliver the client websites because in Genesis everything needs to be coded. In stark contrast to this, Astra’s Agency Bundle delivers a lot of value to people like you who build websites for clients. The Astra Sites that come with Astra’s Agency Bundles will help you to build client websites faster because they are all built using either Beaver Builder or Elementor plugins. Go check out Astra’s Agency Bundles. Are You Interested In WooCommerce Integration? Okay, okay, I know this time the answer is not Yes for everyone. But if you are interested in WooCommerce, then you need to take a look at how easy Astra has made it to work with WooCommerce. Just take a look at Astra’s WooCommerce Integration. Genesis is nowhere near Astra when it comes to WooCommerce integration. And this is after being in business for years at a stretch. Genesis never felt the need to tightly integrate itself with WooCommerce which is the leading eCommerce plugin in the WordPress ecosystem. This says a lot about how Genesis and Astra teams look at things. Are You Interested In WordPress LMS Plugin Integrations? I am specifically talking about integrations with LearnDash and LifterLMS plugins. These two plugins are currently the leading ones in WordPress LMS plugins category. And Astra integrates with both of them. Also check out Astra’s LifterLMS Integration. Genesis on the other hand never bothered to integrate itself with these two leading LMS plugins. But this again is something that speaks a lot about how the teams behind Astra and Genesis themes think. Are You Interested In The Big Genesis Community? There is an argument to be made that by using Genesis theme, you will be part of a very big community and so finding snippets of code to modify your Genesis theme is very easy. Most of the people who make that argument have no value for their time. In my 5 years with Genesis themes, I have myself spent countless hours trying to find snippets of code to make my websites look the way I wanted to. So I know what I am talking about. That big community isn’t of much help. Yes, you might get the occasional help from some really helpful people but you cannot expect them to always provide you with code snippets for every change that you want to make to your website. Besides that, have you seen Astra’s Facebook Group? It is growing fast and is a place where you can directly interact with the Astra team including their founders. Can you talk to Genesis founders anywhere like this? Is Astra As Stable As Genesis? Astra does have some issues here and there but most of them are because Astra is pushing itself hard to innovate by adding new features and integrations that most of its customers want. Genesis has never done that and it may never do that. This lack of features and integrations is what gives the impression that Genesis is stable. To truly test Genesis and Astra stability, Genesis would first need to have the same set of features that Astra has. Besides that, in my use of Astra since it was in Beta, I have never found any major issues with Astra and neither any issues that Astra team is unwilling to fix. Also, we should not forget that Astra is very young compared to Genesis and still has a long way to go. And I am sure that with time, Astra will become one of the finest themes in WordPress ecosystem. Is Genesis Going Down The Nokia Way? Nokia failed to innovate in a rapidly changing mobile market which led to its eventual fall. I see Genesis going down the same path in the rapidly changing WordPress Themes market. Unless the Genesis team does something innovative and reinvents the Genesis theme, I really don’t think Genesis can compete with Astra for long. Or for that matter with any good theme that is page builder friendly. The days of coding all small changes by hand are long gone. Today, almost everyone looks for speed when it comes to building their websites. And Genesis is not helping much in this area. This is where Astra has found its mark. Is Astra Going Up The Android Way? Android reinvented the mobile market and killed other mobile operating systems like Symbian who showed no inclination to push the boundaries of innovation. Similarly, Astra is already pushing the boundaries of innovation with its Astra Sites, WooCommerce, LearnDash and LifterLMS integrations. Astra is innovating and Genesis is not. That is the bottom line. Will Astra be as huge a success as Android? But I do know that Astra team will keep innovating. So go check out Astra. Did This Astra vs Genesis​​​​​​​ Comparison Help? I know, I highlighted all the features of Astra and made them shine in this Astra vs Genesis comparison. But to be fair, Astra theme deserved it. For many years, I was led to believe that Genesis is the best theme in WordPress marketplace. I was a fool to believe it blindly and to this day I hate myself for spending those countless hours trying to code my websites. That precious time which I could have easily spent with my kids and family. I was never a Proficient Coder. Maybe that would have helped me. But it would have still saved me only money, not time. I was never a complete Non-Coder too. Maybe that was what made me lose time because I knew I could eventually achieve what I wanted to if I could find that perfect snippet of code. Are you someone who lies in between a Coder and a Non-Coder? I am asking this question because that is what may eventually help you to decide which theme you should choose, Genesis or Astra. If you are a Coder, then you might want to use Genesis only if you are hell bent on spending time coding every aspect of your website. If you want to save time, then Astra is a better option. If you are a Non-Coder, then just don’t bother about comparing Genesis and Astra themes. Just go with Astra theme. It will save you a lot of time, money and more importantly, it will save you a lot of headache. If you are someone who lies in between a Coder and a Non-Coder, then again, why do you want to waste time, money and energy using Genesis theme? Still confused or have any questions on Astra vs Genesis comparison? Ask them in the comments below. I reply to every comment. Nice write-up. It would be good if you can make Table of Contents for easy navigation and readability. Anyhow, I can’t commit on Genesis since I haven’t used it personally. What I experienced is simple “Astra is the next-generation theme and is more than the love”. I invite you to test Astra on Cloudways and you will be amazed by the compatibility and performance of the two combined. Yes, I agree. Astra is definitely shaping into the next-generation theme. I am actually using Astra on Cloudways for one of my sites and it’s going really great. I have used both Astra and Genesis and found Astra to be a lot faster, easier to manage, and affordable. Being a non coder, Genesis is not my cup of tea. The house example was great and quote creative. Next best theme I prefer after Astra is GeneratePress. Have you had any experience with it? Keep writing such amazing content. Glad, you liked the comparison Shafi. I used GeneratePress for a short while before moving to Astra. Back then, GeneratePress was a little better than Genesis for non-coders in terms of non-coding options but it still needed a lot of coding to make it look and function the way you wanted it to. It remained like that for a long time until Astra came to the scene and started innovating with its non-coding options and integrations. Soon after GeneratePress started doing the same. It is quite interesting that only after Astra launched its Astra Sites with Beaver Builder and Elementor, GeneratePress followed it up with GeneratePress Sites. It just shows that Astra is leading the way with its innovation and competitors are now trying to catch up. I bought into the Genesis ecosystem several years ago because #1 it was a stable platform, #2 the themes had rock solid coding #3 new themes were being issued every couple of months, and #4 Support was terrific. #5 I learned enough CSS to change anything I wanted with no problems. Now those five reasons in mind, I bought into the page builder ecosystem because I saw quickly the reason #5 was no longer valid or needed. So far, reasons 1 thru 4 have remained true with Astra and Beaver Builder. I still have my lifetime license for Genesis and sometime in the future, I may experiment with using BB with one of the Genesis themes if I live long enough. Until them, Astra and BB themes are my go-to starting points for my websites. Thanks for sharing your thoughts Dave. Astra and Beaver Builder are my go-to starting points as well. Curently, i use genesis, i also want to change theme because i’m non coder, but about speed, astra with pro plugin that can be as fast as genesis theme! Yes, Astra is fast with pro plugin. But i have trouble with Astra, i see post thumb or feature image in blog layout of Astra that get high resolution (1024×720) but i only wanna 375×350 ex. I don’t think there is any setting to control that. You might want to look at building a custom blog layout using plugins like Beaver Themer or Elementor Pro. Hey Abhijit… your review is the answer I prayed for, thank you!! Your article finally convinced me about AstraPro – especially since I intend to buy ElementorPro. But the only thing that keeps me from switching to AstraPro is that my old 200-page site is currently in its last migration phase on wordpress (hosted on Cloudways) on a Genesis theme, which I more-or-less like (9 out of 10), but my developer needed to write code for some design tweaks, which I absolutely would LOVE to avoid in the future. My question is this: Can I easily change the theme from Genesis to AstraPro now, before the site goes live, or it’s gonna be easier after that? And if I switch, would I have to go page-by-page to re-design all the site? I am glad this review helped you. Regarding how easy it is to shift from Genesis to Astra, it really depends on what kind of customizations have been made on the Genesis site through code and how each page is built. I would recommend talking to your developer who created your site with Genesis. Whether you switch themes before the site goes live or after it, it does not matter much if you use Staging site to do all the changes. I would recommend doing all the changes on a Staging site and once you like all the changes, then deploy them on your live site. Thanks for the great review. Love the writing style. Would you suggest Astra for a news/magazine based site? I saw that they do not really have any magazine theme or is the theme customisable enough to make it look like a news theme? I am glad you liked this article Raunek. As for the Astra theme, it is basically a plain theme with some great configuration options available in Astra Pro Plugin. However, it won’t give you a news/magazine kind of layout out-of-the-box. You will need to use a page builder plugin like Beaver Builder or Elementor to build the layout. Take a look at the Starter Sites on Astra’s website. All of these layouts are built with Astra theme and Beaver Builder or Elementor plugins. The Personal Blog layout closely resembles a news/magazine layout. Traditionally, all WordPress themes have been providing the site layouts with some configuration options. However, this has always been a problem when you wanted to customize the website as per your liking. With themes like Astra, they provide you with the base configurations and let page builder plugins like Beaver Builder and Elementor control the layout. This way you get immense flexibility in customizing almost every aspect of the website. I am a fan of the way you write blog posts. Rather discribing, you pin point what ultimately user wants. I have question pease enlighten me. I am in a confusion between astra pro and Beaver builder theme. I am tending towards astra due to its features. But I am worried about stability and security of astra compared with BBT. I am planning to launch a social networking website In January. Stability and security are my biggest concern. In Beaver builder site, it was mentioned as BB theme is stable and secure. Nothing related to such things are mentioned in astra site. Please let me know your thoughts on this. If Stability and Security are your primary needs then you should go with Beaver Builder Theme. It is more stable than Astra Theme for sure. you mentioned a couple of times in the comments, that Astra PRO is fast. Is it faster than Astra FREE? Is there some cache plugin (or something) in the PRO version? I use WP Rocket as my cache plugin and the results are amazing. Any knowledge on Astra + WP Rocket integration? And my last question would be about Gutenberg. Have you ever tried it out? Because Astra even has a couple of custom blocks for Gutenberg. Performance wise it should be the best choice as it is the most lightweight comparing it to other page builders. And last but not least, Gutenberg is supposedly the future of WP, so I said to my self: “what the heck, let’s try it out, I have to get used to it eventually”. Oh, and maybe one question after all. Any experience with Generatepress? It has some “front end” Gutenberg editing mode, where it inherits styles from the frontend. Ever tried it out? Thanks and a wish you a nice day. Actually, Astra is the theme and Astra Pro is a plugin that adds additional features to the Astra theme. And Astra theme is free. There is no cache plugin as such. Astra theme by default is developed for speed. I am not a big fan of caching plugins like WP Rocket. In my opinion, caching is something that web hosts should handle on their own. Many good web hosts like Kinsta, SiteGround, Cloudways, etc. handle caching for their customers. I do use Gutenberg and for the same reason that you stated, it is the future of WordPress and it isn’t going to go away. Frankly, I like Gutenberg more than the old editor. There are some glitches here and there but it works very well. It is not a page builder though. You might still want to use pure page builder plugins like Beaver Builder, Elementor, etc. because they come with lot more features. I did use GeneratePress at one point. But wasn’t a big fan of it because I still had to write CSS and PHP code every now-and-then. It was a lot better than Genesis though in terms of design editing capabilities.